A Creative Cookie: The Biggest Design Sale Ever! The Biggest Design Sale Ever! This Summer, I've had a lot of time on my hands. So I thought, why not take that time to make really cool web designs for really cheap? It's a win-win! 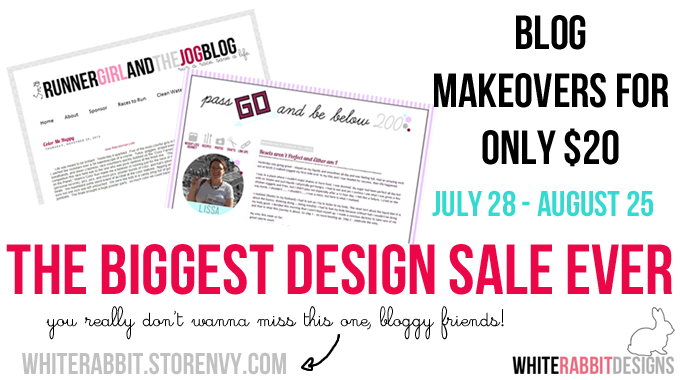 I've put together two design packages for your Blogger blog that are only $20 and $35! I love bringing affordable designs to bloggers, because let's face it, $400 for a design just isn't worth it. So if you're looking for a quick blog facelift or a complete makeover, I'd love to help you out. This sale starts July 28th and ends August 25th. As long as you get your purchase in before Aug. 25th, you're good to go! A cute but functional blog design catches the eye and keeps the readers reading. I'd say it's one of the most important things about a blog, besides the content, of course. :) Click here to check out my shop and click here to see my portfolio.